The North Carolina rental agreements are forms created for the relationship between a lessee and lessor for the use of commercial and residential property. All documents must be written in accordance with Chapter 42 (Landlord and Tenant) and upon the signature of all parties involved the contract becomes legally binding. 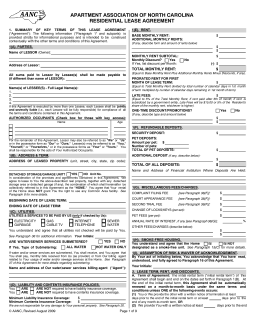 Rental Application – Used for the verification purposes on behalf of the landlord in order to check the tenant’s background, job, and previous rental history information. Association of Realtors – Provided by the North Carolina Association of Realtors, also known as FORM 410-T, for the residential tenancy between a landlord and tenant. Commercial Lease Agreement – For space that is utilized for a professional service or retailer. Lease with Option to Purchase Agreement – Standard form that also allows the chance for the tenant to buy the property on agreed upon terms from the landlord. Month to Month Lease Agreement – Under § 42-14 a lessee may terminate this type of tenancy with at least seven (7) days’ notice. Room Rental (Roommate) Agreement – Form that binds the individuals sharing a common housing structure to tasks such as cleaning and how much each shall have to pay for bills, rent, etc. 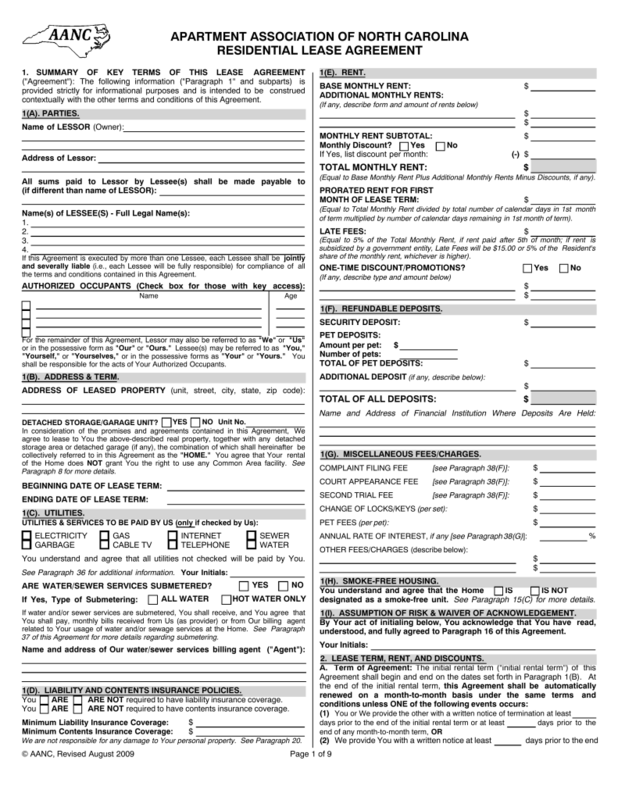 Standard Residential Lease Agreement – Provided by the Apartment Association of North Carolina for fixed tenancies last (most commonly) of one (1) year. Sublease Agreement – The act of a lessee letting someone else use their property until the end of their term on the property. Termination Lease Letter – Allows a lessor or lessee to cancel their tenancy-at-will with at least seven (7) days’ notice per Statute § 42-14. Lead-Based Paint – Federal law requiring all landlords and managers of residential units constructed prior to 1978 to fit their tenants with this disclosure document. Must be signed by every mentioned lessee in the rental contract. Security Deposit (§ 42-50) – If the landlord elects to obtain a deposit from the tenant they will be obligated, within thirty (30) days, to provide information on where it is being held. Furthermore, it must be located in a licensed trust account at a financial institution located in North Carolina or the landlord may furnish a bond for the amount from an insurance company licensed to conduct business in the State. There is no law in North Carolina that requires the landlord to give any specific notice before a landlord may enter the property of the tenant. Maximum (§ 42-51) – For month to month tenancies only one and a half (1.5) months’ rent. If longer then the lessor may charge up to two (2) months’ rent. Returning (§ 42-52) – After tenant has vacated the premises and delivered possession to the landlord they may receive their deposit within thirty (30) days. If there is damage to the premises the landlord may send a notice within the thirty (30) day period suggesting that an additional thirty (30) days is needed to estimate for the repairs.